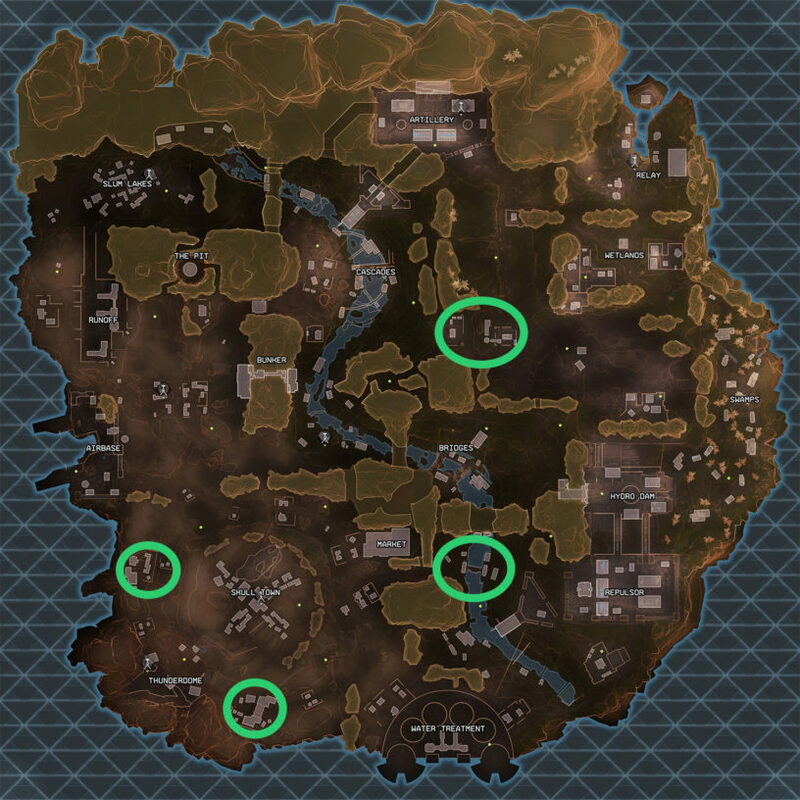 Home » Apex Legends » Apex Legends Best Drop Locations & Loot Spots – Our Look at the Top Landing Spots! We're taking a detailed look at the best landing spots in Apex Legends! Our Apex Legends Best Drop Locations & Loot Guide details all the top options available as you head into a match. We're taking a look at Hot Zones, Supply Ships, Supply Drops, and some great landing spots whether you are new to these type of games or are a veteran! 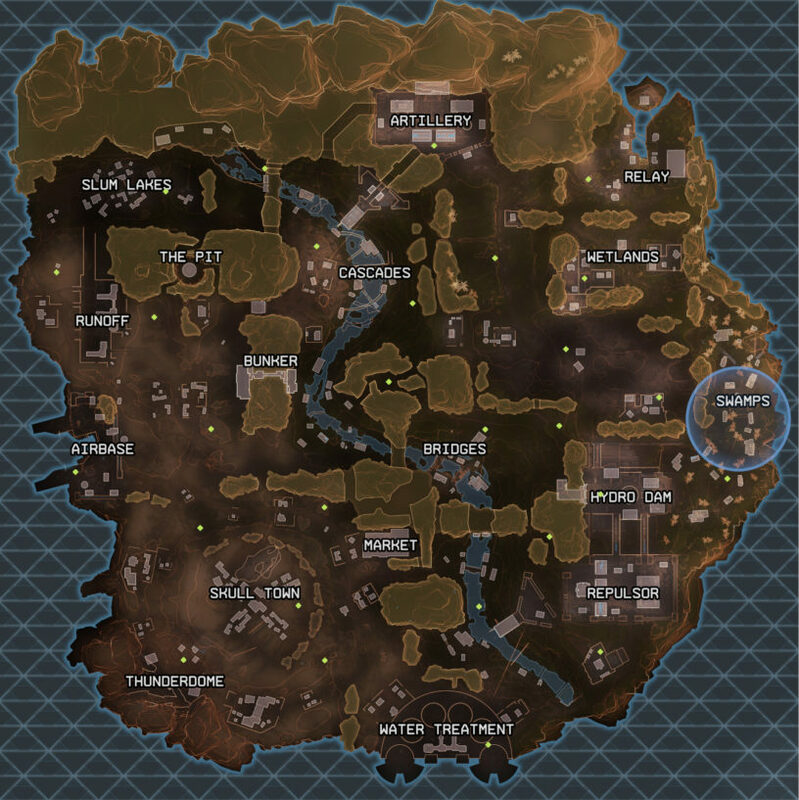 The good thing about Apex Legends' current map is that all the named locations are all pretty good when it comes to loot. That's not to say there aren't some particularly good spots, it just means that you shouldn't be too worried about where you land for the most part. While this is the case for general landing, there's some stuff to know about looting around the map and that is all listed below! These are the spots for the absolute best loot. That doesn't mean I fully recommend landing in these spots, they are going to be highly competitive, so only land at them if you are confident in your play. We'll look at more reasonable spots to land deeper into the guide! At the beginning of the game a randomly chosen areas is designated as the Hot Zone. This area contains high value loot and some guaranteed Legendary gear, or a fully kitted weapon. You'll know you've found a fully kitted out weapon if it appears gold on the ground. The gun itself is not special, it just comes fully equipped with top tier attachments. This gives you a big advantage right away, because attachments are a huge step-up in the early game against players who are still struggling to find gear and weapons. As you can see from the above map screenshot, the Hot Zone is placed over the Swamps. There is no real rhyme or reason to where it is placed, but if you've got a strong group it is worth hitting these areas. If you are just starting out, however, steer clear of them because they are a popular landing spot. Another very hot area to land for great loot is the Supply Ship. This is kind of an interesting and new idea in Apex Legends, and it takes advantage of the lack of fall damage in the game. If you played Fortnite during Season 6 you'll remember the floating island, and that's kind of what this ends up being. The ship shows up at one edge of the map and makes its way towards a teal marker on the map where it will eventually land. You can land on it at the beginning of the game, and it has some of the best guaranteed loot on the map. Again, this is an area that's going to be frequented pretty heavily. You'll need to grab a gun as quick as possible and try to eliminate anyone who doesn't have one. If you don't get one immediately, you are likely better off just jumping off the side and looking for loot elsewhere. Once the Supply Ship reaches the marker on the map it will settle down and attach ziplines to parts of the land. You can then reach this area from those ziplines if you desire, but it's usually pretty looted by this point. You can get lucky sometimes, you'll want to make note of where it flew in from and if it was far from the drop path. If it was then there's a good chance it might not have been looted yet. If you don't want to gamble on a Hot Spot or a Supply Ship then these are the places that are good for landing. For the most part, any named area is going to be serviceable for loot. If you want to avoid players then land somewhere that is further away from the path. If you don't mind getting in some fights, then any named area that is close to the path will work. When you enter specific areas on the map you'll notice the name listed to the right of your mini map. Under the name of the location, it will display a tier rating of the loot. It goes High, Mid, and Low Tier Loot. These designations stay consistent in each game, so here's a map displaying the tier areas. While you don't have to always land at a high tier loot area, it's obviously going to be beneficial to you if you do! I'm going to list a few of the locations in particular that seem good below. The Bunker area has two sides to it, and either the left or right side has multiple supply crates to quickly grab. You can run inside and there's a ton of loot scattered in various rooms. This is tight quarters, however, so if you don't like close quarters combat you might want to avoid this option. It's towards the middle of the map, so it will see some action in most cases. This is a good spot for a bunch of crates and loot scattered around particularly in the large compound area on the right side. Relay can be good spot if you are new and it's towards the end of flight path, but if it is right over it then you are going to likely get some battles. This spot can sometimes be problematic for getting to the next circle, but look for a nearby relaunch balloon that you can take which should solve that issue. Water Treatment is a big area and if you land towards the back of it you can find a ton of early Supply Crates to grab loot from. The options from there are great due to the ability to head both east or west depending on where the circle ends up. The north east side is the stronger option due to the many buildings near the river in this unnamed area. If you are really new and want to just get some loot without getting eliminated immediately then head to the following locations. 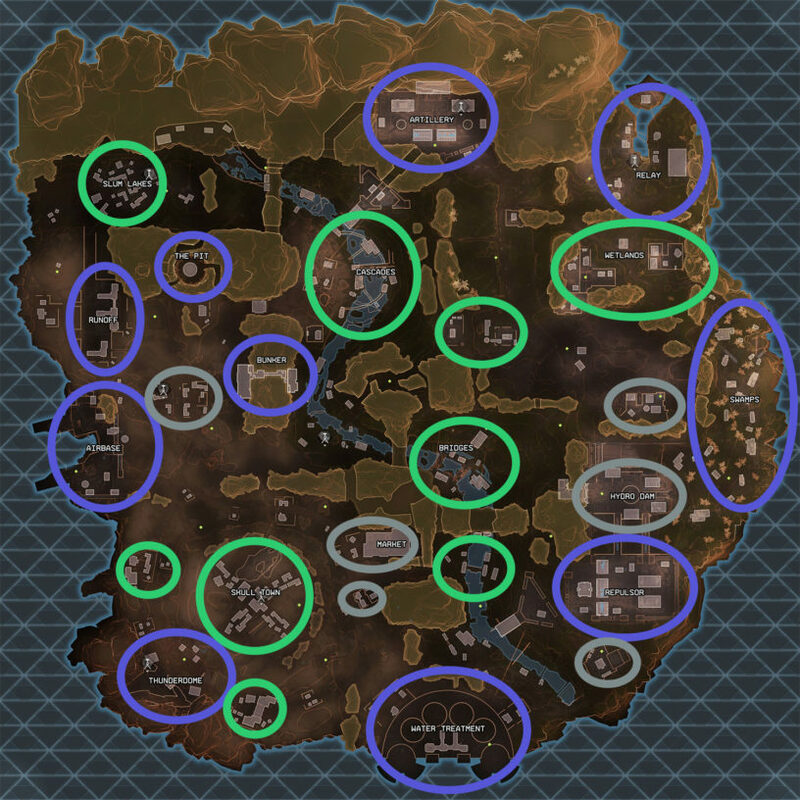 These are all locations that are designated as mid-tier loot but don't have a name to them. Areas that aren't labeled will generally see less traffic than ones that do. You can go to these areas for pretty good loot, and likely avoid any other players in the process. These are things that are on the map or will eventually be on the map throughout the game. This is an obvious one to players who have been playing quite a bit, but I've seen people pass right by these. They kind of have a tendency to blend in with the map, but Supply Crates are useful for grabbing quick loot and can have a variety of things inside of them. Don't just pass these by when you see them, open 'em up and grab some ammo and whatever else might be inside! Periodically throughout the match you'll see a small blue circle on the map. This designates an incoming Supply Drop to that spot. These give you a big chance to get Legendary gear and weapons. As far as I know, these are the only way to find the Kraber .50-Cal Sniper and the Mastiff Shotgun. They are currently the only two Legendary weapons in the game, and are very powerful in the right hands. The problem with Supply Drops is that they are very obvious when landing on the map, so if anyone else is in the area then they are going to be headed in this direction. Be careful when looting these because you will be a sitting duck if anyone else comes to check it out. If you have a Gibraltar they can drop a shield on top of it, or you can use a Bangalore smoke to obscure the area. Supply Drops look exactly like Lifeline's Care Package ultimate, but where a Supply Drop can have weapons the Care Package cannot. As you are running around the map, be on the look out for drones that look exactly like the ones you open outside of the game to get skins and cosmetics. They are scattered all across the map, and you'll recognize them by their purple blinking light. 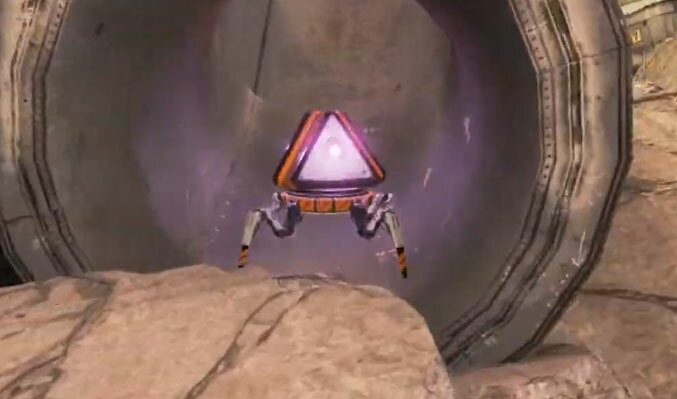 You might have heard a robotic beeping sound while running around the map, this is a giant tell that one of these drones is around. If you hear that sound, be sure to check that area out and look for one of these little guys. If you see a Drone, it can be blinking either purple or gold depending on what loot is inside! If you see a gold one, you know you are going to get a Legendary item. When you find one, all you have to do is hit it with a melee strike and it will pop open some potentially good loot! One of the best ultimate abilities in the game is Lifeline's Care Package. If you have one on your team, you should be feeding her Ultimate Accelerant as much as possible. 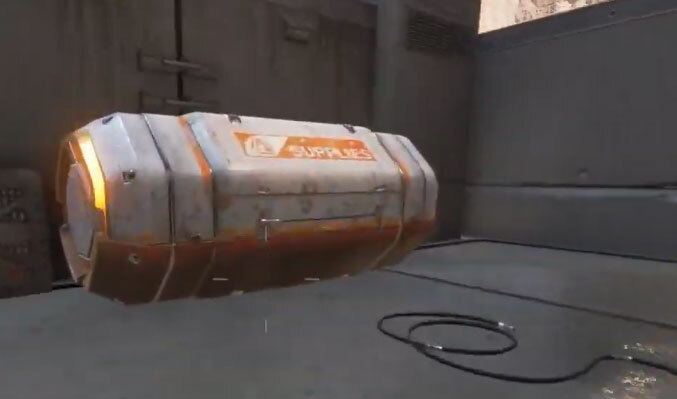 She can drop down something that looks exactly like a Supply Drop (only difference is that it can't have weapons), and can contain high tier healing or regen, gear, and attachments. You are guaranteed three items (one of each of the ones I just listed). This is extremely helpful in the early-to-mid game where parts of your team might not have upgraded gear yet.